Thank you Potatoes USA for sponsoring this post. 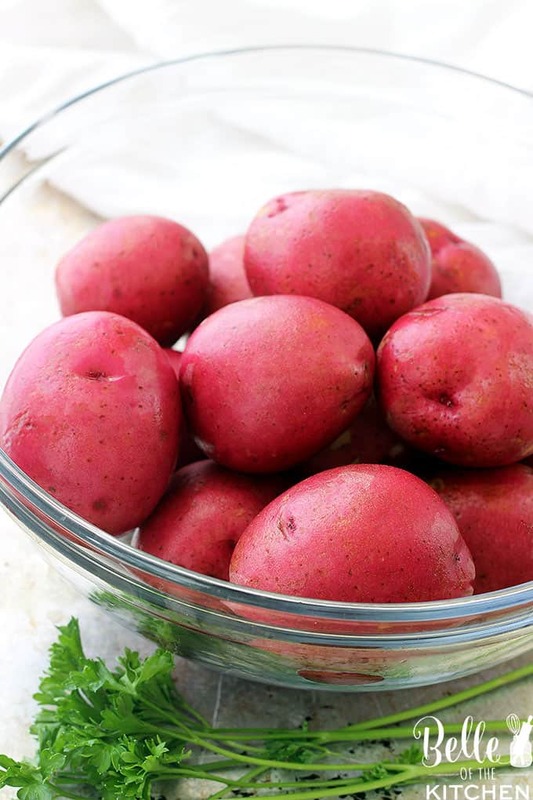 Make a delicious and convenient meal today with potatoes! 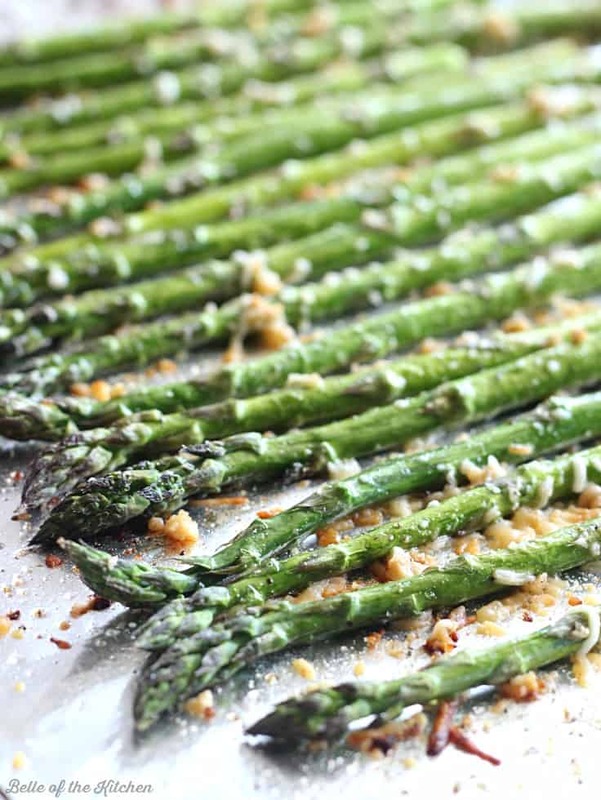 Looking for a simple and delicious side dish? These Pesto Roasted Potatoes and Green Beans are made with just four ingredients, and couldn’t be easier to prepare! Happy Tuesday, BOK readers! I’ve been in and out lately because life with three kiddos has thrown me for a loop lately! My youngest will be five months old tomorrow and I’m still adjusting to the lack of the sleep and overall chaos/disorganization/coffee-dependency that goes along with that. He has also been snuffly this past week dealing with his first cold. 🙁 So there hasn’t been a lot of sleep happening around here either, and I’m really feeling the effects of that, y’all. SO. TIRED. But in good news, my older kiddos have started school, so there is at least a wee bit of peace during the daytime and the baby is able to take nice long naps! I’m so thankful for that because it allows me to get some things done around the house, including getting dinner prepped. My crockpot has been a real workhorse over the past few months, but side dishes have kind of been a struggle. I don’t like to spend too much time on sides and prefer them to be easy peasy. 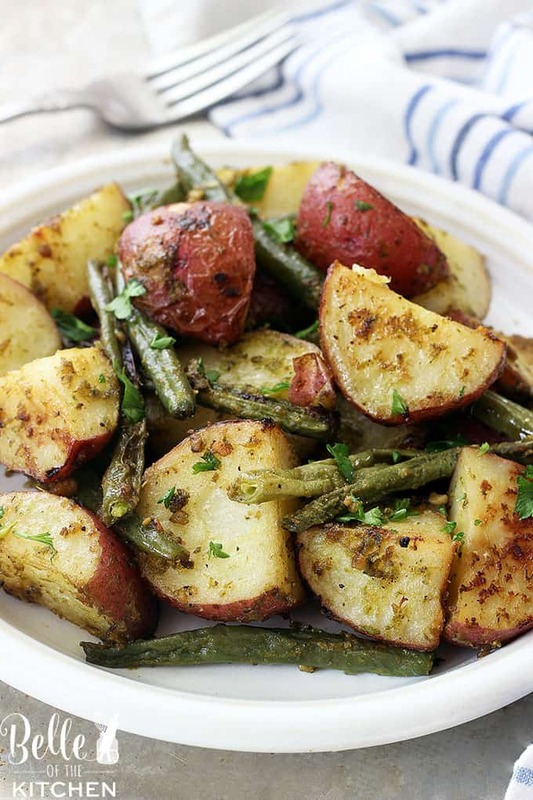 Cue these Pesto Roasted Potatoes and Green Beans!! Potatoes are a family favorite at our house. I love them because there are SO many ways to prepare them and they make the perfect canvas for just about anything. 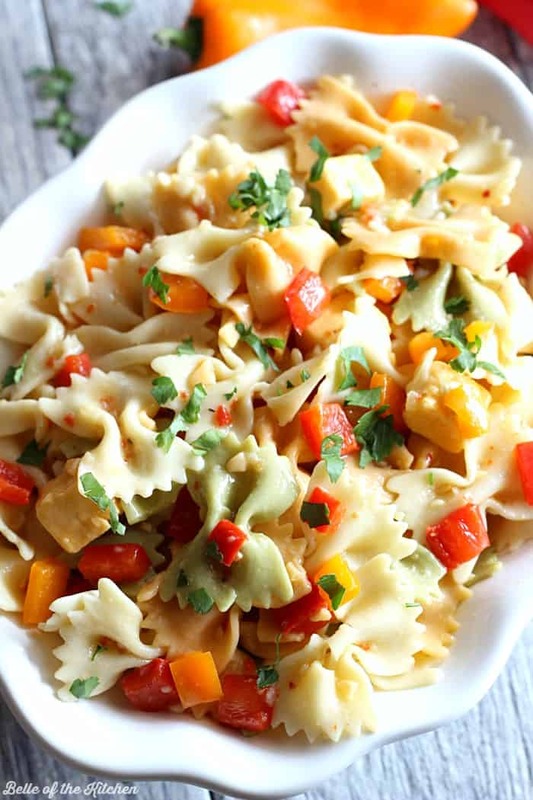 They are convenient, too, and I always seem to have them on hand, which is perfect for quick recipes like this one that I can throw together and have on the table in less than 30 minutes. Easy and fast are the kind of recipes I’m all about these days! These Pesto Roasted Potatoes and Green Beans only require four ingredients and just a few minutes of hands-on time. The rest of that time is spent in the oven roasting to savory deliciousness while you do whatever else you gotta do! Did I mention they are made with PESTO?! How awesome is that stuff? I swear it’s one of my favorite ingredients ever because it adds so much flavor. I don’t know why I have never thought to pair it with potatoes before, but man, they are the perfect vessel for its garlicky goodness! I’m SO glad it finally dawned on me to try it out! Just add in some green beans and you are set! If you’re a fellow potato lover, be sure to check out the Potato Goodness Facebook page for more yummy ideas and recipes. I spied a pretty delicious looking Potato Pizza on there that I’m going to have to try soon. Preheat oven to 425 degrees. Spray a rimmed baking sheet with cooking spray and set aside. 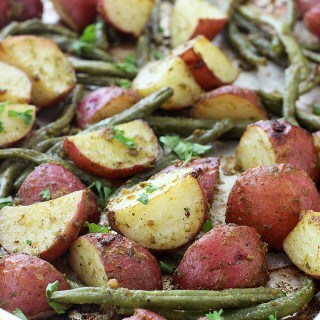 In a large bowl, combine the potatoes, green beans, pesto, and salt and pepper. Mix carefully making sure all of the veggies are well coated. 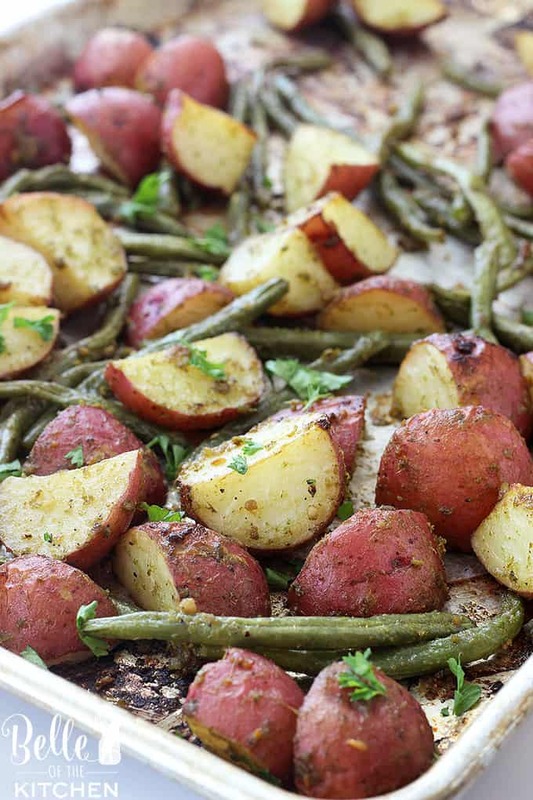 Spread the potatoes and green beans out onto the prepared baking sheet. Bake in the preheated oven for 25-30 minutes, stirring the mixture once halfway through cooking. Adding pesto to veggies and roasting them sounds amazing! I’ll definitely try this! I totally get busy days so this recipe is an answer to prayers! So quick, so flavorful and so easy! I’m glad you can find time to post tasty recipes like this one and help the rest of us out! What a delicious looking side dish! I love how you used pesto here, it surely sounds like it brings tons of yummy flavours to the dish! I am not looking for asimple and delicious side dish any more because I have just found one – these pesto roasted potatoes and green beans. Fantastic side to serve for dinner! Just made this. It’s simple and taste so good. Thanks for sharing! So glad you enjoyed it, Staci! I think my red potatoes were too big. Green beans were done when I stirred them 1/2-way through, but potatoes weren’t done at then end. I scooped them out and gave them another 20 minutes in the convection toaster oven. If I attempt this again, I will cut potatoes smaller and add green beans 1/2-way through. This is genius! So easy to prepare and I can’t wait to try the dish! 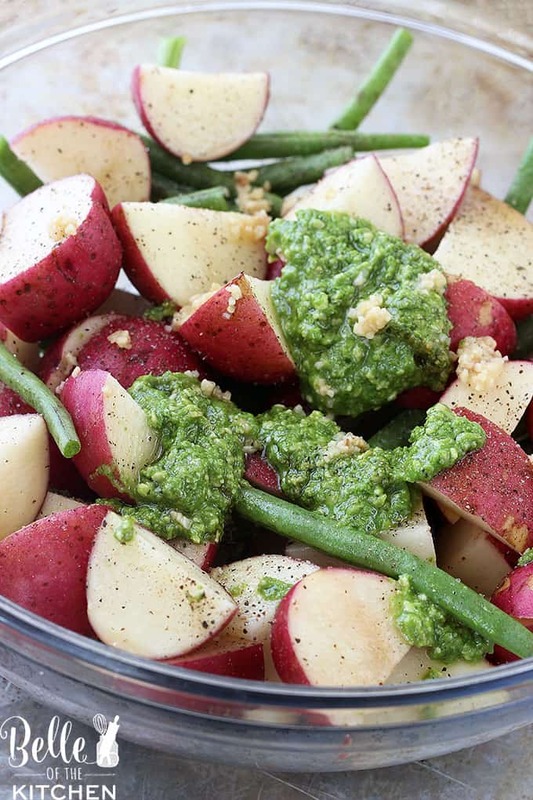 Love using pesto in cold potato salads but roasting potatoes in pesto. Genius! Roasting potatoes is my favorite way to cook them. I love the addition of green beans, this recipe looks delicious. We love pesto on pasta, but I can’t believe I have never thought to use it on potatoes. Such a simple and clever idea! Great side dish for steak! This is the kind of side dish I love to make extras of and devour for lunch the next day as the main deal. Sounds delicious. I love easy side dishes like this! 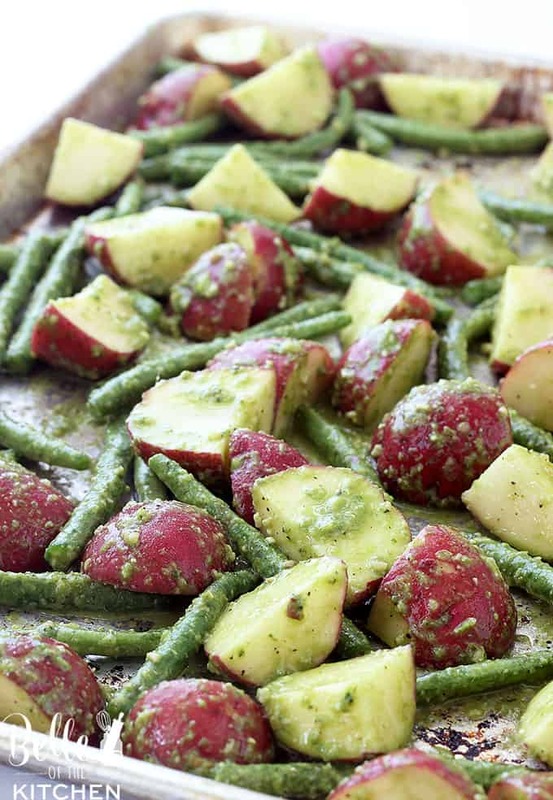 The potato green bean combination is wonderful and I love the pesto! I made this yesterday and it was delicious. I used a huge russet potato instead of red potatoes and I topped the mixture with oranges before I put it in the oven. I took a picture but it didn’t come out very good. But thanks for the recipe. Sounds delicious! Glad you’re enjoying the recipe! This would be a great fall side dish! I see this being added to my Thanksgiving menu! I love all the ingredients! Can’t wait to try this! That’s a great idea for a side dish! I struggle with sides to and this looks like you’ve solved my problem! I love roasted veggies and adding pesto was such a great idea to kick it up a notch! Now this is a side dish that I need to make! Looks delicious! This looks like the perfect side dish! Roasted is one my of most favorite ways to enjoy potatoes – these look awesome!